Your pet has a heart murmur? So, your pet has a heart murmur? At your pet’s last physical examination, your vet told you they’ve heard a heart murmur on your pooch or kitty. So what does this mean and what should you do about it? First let’s check what a heart murmur is. A heart murmur is the sound of abnormal or turbulent blood flow within the heart. Normally, there are two distinct heart sounds often described as “lub” and “dub”. Together these make the heartbeat: “lub-dub…lub-dub…lub-dub…”. When there’s a murmur, it sounds more like “lub-whoosh-dub” or sometimes just “lub-whoosh” or in severe cases “whoosh…whoosh”. The turbulent blood flow that causes the murmur is usually the result of some kind of structural change or defect in the heart. In younger cats or puppies for example, it could be a defect that they were born with (called a congenital murmur). In older pets, it is usually a defect that they acquire over time (called an acquired murmur). Heart murmurs can indicate serious and life-threatening heart disease. Cats are notorious for seeming fine and not even having a murmur and then developing heart failure very rapidly. Heart murmur is also a fairly common sympton in dogs that is often seen and treated in vet clinics. In more severe cases it can be part of distressing conditions both to the dog and the dog’s owner. Heart murmur in pets are not a disease in itself but they can suggest that the animal has an underlying problem that should be dealt with. 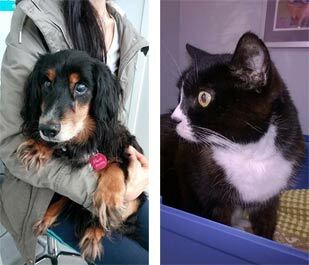 These are some of the reasons why we, at Ellerslie Vet Clinic, recommend regular preventative care visits and will listen to the heart during every exam. The vet won’t know why the blood flow is abnormal just by listening to the heart alone. In many cases an echocardiogram (ultrasound) is done in conjunction with an electrocardiogram and chest radiographs. We are fortunate that Dr Kathrin Brinker is an excellent ultrasonographer and that we can perform echocardiograms as well as electrocardiograms and digital X-Rays in our clinic. Pets can live a long time with heart disease but sometimes it can progress rapidly. To understand more about prognosis, it is important to understand why the murmur is occurring and how far along the heart disease has progressed. Medications and testing are aimed at preventing congestive heart failure. In this end-stage of heart disease, the heart can no longer effectively pump blood to the body and fluid begins to leak into the lungs and/or chest and abdominal cavity making it difficult to breathe. With heart disease in general, your veterinarian’s aim is to help prevent congestive heart failure or sudden heart death for as long as possible. Lovely Maggie has an acquired heart muscle disease which causes thickening of the heart muscle, which influences the blood flow in her heart, the volumes the different chambers of the heart have to deal with and pressure gradients between the different chambers and over the heart valves. She is coping really well so far and keeps her cat Dad busy managing all the different medications for her various little health issues, which sometimes seems like a full-time job!